Van Damme has a lot in common with Stephen Seagal...except Seagal is a much better actor. Van Damme can't show any emotion, growth, skills other than kicking people. And yet this man has been in 36 movies. I should hate the man, but in spite of my sometimes elitism about popular culture, I kind of like really bad movies...and Van Damme has made a lot of them. However, he's never really sunk to the true level of dreck that makes a classic bad film. 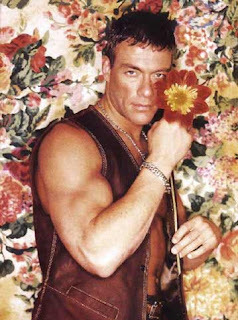 Van Damme still has a ways to sink yet. He hasn't done the marvelously self-aware commercials that Seagal has. He hasn't made anything as classically hideous as Over the Top, Commando, or Road House. When he really begins to bottom out, I might have to start liking him.